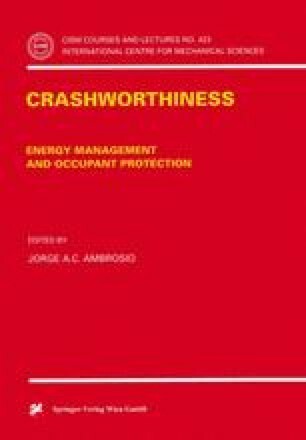 In crash safety research and development, like in many other engineering disciplines, a strong increase could be observed during the last thirty years in the use of computer simulations. This is due in part to the fast developments in computer hardware and software, but in case of automotive safety, probably even more due to emphasis which has been placed on the development of reliable models describing the human body in an impact situation, as well as numerous validation studies which have been conducted using these models. Mathematical models of the human body in conjunction with a mathematical description of the vehicle structure and the various safety provisions and restraint systems, appear to offer a very economical and versatile method for the analyses of the crash response of complex dynamical systems.